Onetime still hasn’t decided what he wants to be yet, and I’m just hoping that his final idea will be as easy as the black cat costume we whipped up last year! Now that I’m back at work teaching full time again, I’m always looking out for fun activities to do that are super fast to prep, and which work on an academic skill. 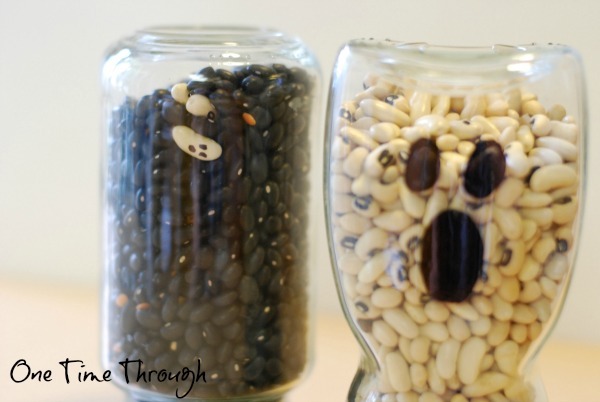 Today’s ghost sensory jar game can be made in under 5 minutes and is a fun Halloween math activity that can be modified to challenge kids of all ages. Read on to find out how to make one and how to play the game! As a Teacher-Librarian, I’m always looking for connections between books and fun activities. 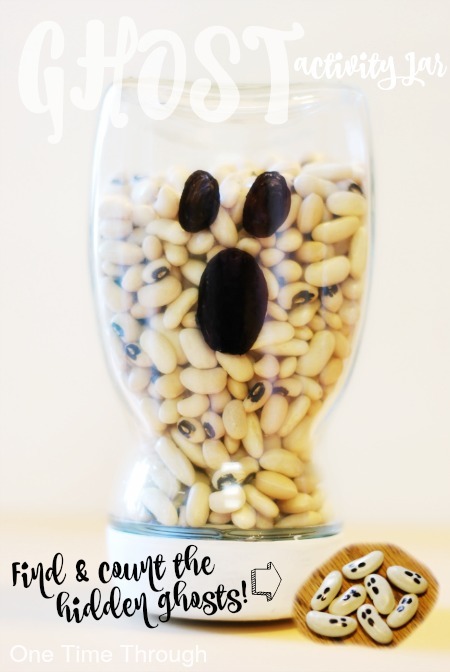 In fact, the idea for this jar came after I read the adorable Halloween book Ten Timid Ghost to Onetime. This fun little counting story got Onetime to practise his counting to 10, and led to some great discussions about subtraction! Plus – the illustrations of the timid ghosts (who are trying to hide from a mean witch who wants them out of their house) are just too cute! A Halloween favourite at our house. Goo Gone or a Magic Eraser to remove label goo! 1. Wash out your bottle and remove the label. 2. Choose 10 white beans that look like the shape of ghosts. Write the numbers from 1 to 10 on them. Underline the numbers 6 and 9. 3. On the front of each white bean, make a simple face with two eyes and a mouth. Aren’t they cute? 4. 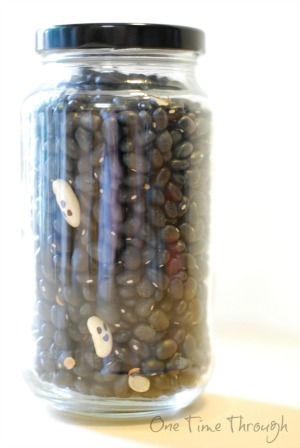 Mix the ghost beans into a bowl with black beans and lentils OR with more white beans OR with black-eyed peas for a real challenge! 5. Pour the beans into your bottle and seal tightly or with hot glue. 6. Add a ghostly face to the outside of your jar with the permanent marker. Ta-da! You’ve got a creepy counting ghost sensory jar game! There are different ways to use the sensory jar, depending on your child’s age. Challenge your child to find all 10 ghosts in order from 1 to 10, or backwards from 10 to 1! Use white beans as the background along with the “ghosts” OR to make it super challenging – use black-eyed peas as the background filler. Make more ghosts with higher numbers! Instead of numbers, use the letters of the alphabet. 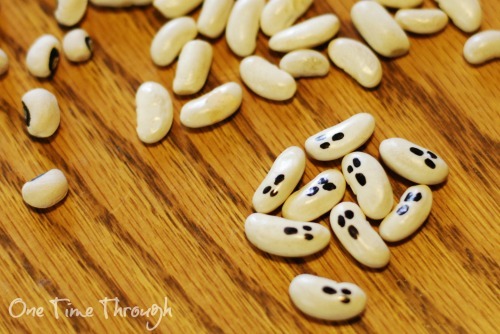 Can you think of any other ways to use these adorable little white bean ghosties? I’d love to hear your ideas. Please leave me a comment below. What a cute idea! These make adorable counters for math homework, too!